The Fleet Management System protocols (FMS and Bus-FMS ISO 11992-1 ) are being used by a number of leading Bus and Truck manufacturers to provide interoperability of systems installed on heavy commercial vehicles and buses. They include a standard set of addresses and layouts for CAN messages used in these industries. 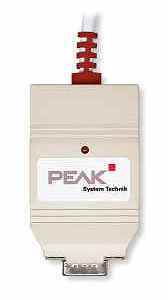 The PCAN-FMS package, along with one of Peak’s wide range of CAN interfaces, will help you develop or debug your FMS application. 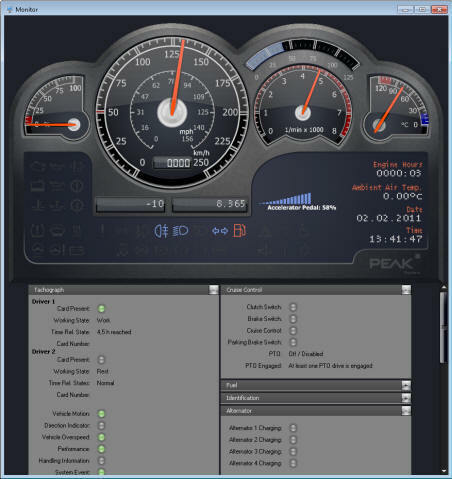 Used in the simplest way the FMS CAN bus is monitored by a PCAN interface, the FMS messages are decoded and their values displayed in a window, on the PC, as a “Dashboard” with simple dials and indicators. If you want to you can then log all of the bus activity to a disk file. Alternatively you can take a previous log – input it to the FMS package and the result will be output to the CAN bus (and Dashboard) as well; allowing you to replay the events and use them as a source of stimuli for testing an application. The PCAN-FMS package can also create an FMS data stream by allowing the engineer to enter values via an easy to use graphics interface. 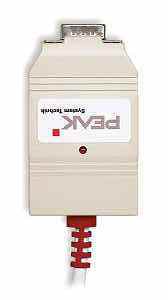 For a PCAN-B10011S bus converter that links a high-speed CAN-node and a truck trailer CAN bus (ISO 11992-1) Specification follow this link. Tour mode provides the ability to launch pre-selected projects from the Desktop to simplify automating standard runs as well as providing additional drive Data such as fuel consumption and average speed.